Is your business a jet or a hot air balloon? Is your career full of hot air — mildly attractive yet ultimately floating around slowly, taking in the sights but never truly engaging with them? Or is it streamlined for ultimate efficiency, zipping along at a good clip? 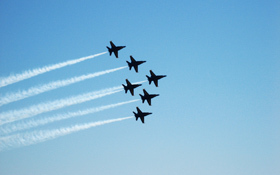 When you run your own business — even if it’s a service-based business-of-one that you run out of your bedroom — you always want to be a “jet.” Not only do jets command higher rates than hot air balloons, but they’re just plain better at their main objective: flying through the air. You’ve been wasting time going over the same information again and again. It seems like every day someone asks you what your company policies are. Or how much you charge for standard services. Or where they can find copies of your e-course/workbooks/newsletters/whatever. And, each time, you write out the exact same response. And, each time, it takes out a lengthy chunk of your day. Solution: If you’ve been sending out more-or-less the exact same responses every time you sit down to answer your e-mails, it’s time to create some pre-written (canned) responses. Perform a quick Google search, or read through the “help” section of your e-mail provider, to find out how to do this. You can also take advantage of your website by creating an FAQ page (a dedicated page for commonly asked questions — and their answers!). The “Feast or Famine” cycle can be tough. However, if you’re constantly scrambling for money — if your “famine” lasts much longer than any of your “feasts” — then you could have a much more serious problem on your hands. Solution: Save what money you can and re-examine your business plan. What’s been making you money? What hasn’t? Pinpoint the moneymakers and rework your strategy to focus on them. All you ever do is work. Your family misses you and your friends barely remember who you are. The thrill of having “too much” to do has worn thin. You miss living your life. Solution: Readjust your schedule. It’s all about prioritizing. Learn to say no. But also know when to say yes. Rather than agreeing to every project that comes your way, pick and choose the best of the best. Take a tip from an old adage and work smarter, not harder. You don’t have to exhaust every fiber of your being in order to make ends meet — there are numerous ways to earn income passively and retain control over your non-work life. However, if you’re not prioritizing your time, or if you’re working inefficiently, you will always be working harder than necessary. Douglas Adams once said, “I love deadlines. I like the whooshing sound they make as they fly by.” Which is a great quote, but it’s not something you want to be known for — not when high-paying clients are involved. Solution: If you’re forgetting details and missing deadlines, scale back or get more organized. Social media can be both a blessing and a curse. For all its benefits, it has one major drawback: it’s all too easy to feel like you’re doing a lot of work…when you’re really doing none at all. Solution: Choose a day and automate. Once or twice each week, schedule your social media interactions in advance. Or, set time limits — set aside a specific amount of time for social media and stick to it. Or, outsource your social media updates to someone else. You may also wish to re-examine your overall social media strategy (what works?) and re-adjust to focus solely on the moneymakers; the outlets that bring in the most business. And, of course, be honest with yourself: have you really been networking and marketing? Or have you merely been web surfing? Crafting your image, your brand, takes a lot of hard work — it’s only natural you’d want to stay on top of it. But, if you’re spending all of your time searching for what others think of you, rather than working to create things for them to think about, your business won’t get very far. Solution: Set up Google Alerts to keep track of your name and company reputation. Use Talkwalker for the hits that slip through the cracks. Set them up, then forget them. You’ll be notified if anything pops up. In the meantime, you can continue working. Whether you’re working on your own or managing a group of people, it’s all too easy for paper-based memos and invoices to get misplaced. The more your business grows, the more you’ll have to keep track of. Have things been getting lost in the shuffle? Solution: Go paperless. Everything from proposals to accounting to team organization to personal organization to storage back-ups can now be done digitally. Try trading in your dayplanner for Google calendar. Anything that doesn’t have to be a hard copy shouldn’t be. For example, if you’re a software developer and you’re losing track of your proposals, fill out this free proposal worksheet, then register for an online proposal software (like Bidsketch) so you don’t have to worry about it anymore. You sit down to work and the next thing you know, the day is over and you “haven’t done anything.” Over half of the items on your to-do list remain un-ticked and you can’t understand why. Where did the day go? Solution: First off, time hasn’t sped up; you’ve slowed down. Find out why. Track your time and see which tasks take up the bulk of your work day. If your results seem reasonable (no misspent time) then you could simply be over-scheduling. But, if you notice large areas of wasted time, now’s the time to re-adjust your habits. Try bulking similar tasks together. And, if you need to drive, plan your trips wisely — try scheduling trips in the same area all for the same day. Stop multi-tasking. Contrary to popular belief, people who multi-task actually get less done overall. Take your day one step at a time and try to eliminate any distractions ahead of time (turn off notifications, set your phone to voice mail, close your office door, etc.). You’re having trouble sleeping, your concentration is fuzzy, and your body has mysterious aches. Your immune system has been through the ringer and you get the sniffles more often than you get called to dinner. You’re tired, stressed, and tense all the time…and you’re not sure why. The work itself hasn’t changed, so why have you? Solution: You’re burned out. Take a break. Eat, sleep, and get some exercise. It can be difficult to put your health first, but remember this: you can’t run a business if you’re dead. Take some time to rest and recuperate. Your business will still be there upon your return and, unless it’s been horribly mismanaged, can survive without you for a few days. Do you honestly loathe the work you do? If you know deep down in your boots that what you’re feeling isn’t “burnout” — that it’s something far more serious — then you’ve got some thinking to do. It’s one thing to get the newbie jitters or the occasional lack of confidence when faced with a tough project; but it’s an entirely different ball game if you’re fearing you’ve made the biggest mistake of your life, and hating every minute of it. Solution: If you still believe in your overall goal and your business as a whole, but simply hate performing the work — or a large part of the work — consider outsourcing. If the problem isn’t the work itself, but who you do the work for, then do some house cleaning. Drop your worst clients and replace them with more suitable ones. Change your attitude or change your career. If you have to start over, it isn’t the end of the world. Most entrepreneurs don’t get it right the first time out of the gate. Most don’t get it right the first few times out of the gate. Startups consistently fail and that’s fine. You can rebuild. It’s better to own up to making a legitimate mistake with your career choice and start over than to wait until your frustration sets your ship on fire and you go down with it. Whichever path you choose to take, aim to make your business streamlined. Why be miserable when you can be a jet?